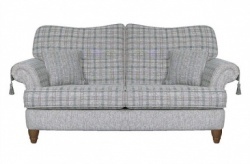 The Selkirk 3 seater sofa comes with reversible cushions which can make up a pattern and plain combination. 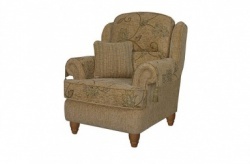 Matching 2.5, 2 seater and armchair available. 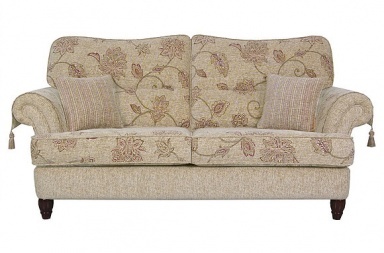 The fabric pictured and available to buy online is Floral Pebble on mahogany legs. 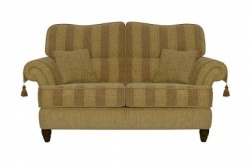 In the related products below - you will see an image of the 2 seater in Stripe Gold on mahogany legs. 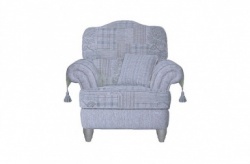 The 2.5 seater is also shown in Check Frost on oak legs and the armchair is in Patchwork Frost on grey legs. Choose your back and seat cushion design from check, stripe, floral, patchwork or plain all over. Then choose your colour from Frost, Gold or Pebble. Lastly the legs could be grey, oak, mahogany or black. All items come with narrow striped scatter cushions and arm throws which will match your design choice.